If your child is between age six to twelve, chances are that the tooth is naturally loose because the osteoclast cells destroy the tissues at the root so that a permanent tooth can come out. In this case, the tooth can fall out on its own. There are other cases where an impact can loosen the tooth. For instance in case your child falls down or something hits them. When such an accident occurs, it is best to visit your dentist to avoid infections that can damage the teeth. Allow nature to take its course if the tooth has loosened naturally. Eventually, the tooth will fall out. The process will be easy and painless unlike when you try to force out the loose tooth. Don’t be alarmed if the tooth is taking too long to fall out, because every child is unique. When the time comes, your child may even wiggle it by themselves. It is okay if you notice a little bit of blood when the loose tooth falls out naturally. Have the child rinse out their mouth with clean water. There may be more blood involved if the tooth is forced out or knocked out by accident. In most cases, baby teeth fall out in the order they came in. This means that the first causalities are the front teeth. Their roots naturally dissolve causing them to fall out painlessly. An attempt to wiggle out a loose tooth will cause pain for the child because of the tugging and pulling at the sensitive roots. It is better to consult a dentist if a loose tooth seems stubborn or is taking too long to fall out. If you sense that the loose tooth of your kid is ready to come out, here are some simple steps to follow that will make the process of removing a loose tooth painless or even a fun experience for your kid. With a little guidance, your child can do it himself! Wash your hands thoroughly; it is prudent to have your kids wash their hands well so that they can be involved in the process. Feel how the loose tooth is, it may need a gentle wiggle back and forth and a little twist to pull it out. Use a clean gauze or cotton swap to apply pressure to the gap. Your child can help in this as well. The bleeding should stop in a few minutes. 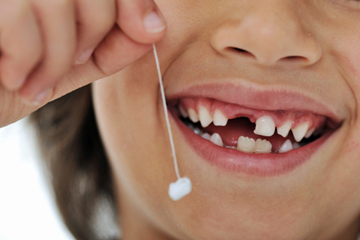 The next thing is to examine the area to ensure there are no fragments of milk teeth left at the root of the tooth. Otherwise, the area should be clean, ready for the permanent tooth to crown. If you notice a fragment or something that doesn’t look right, consult your dentist immediately to avoid further complication. To make it memorable for your child you can bury the tooth or have them put it under their pillow so that the tooth fairy can bring a reward in exchange for the tooth. Keep examining the gap for a few days to make sure it heals properly. Consult the dentist if you notice any sign of swelling or redness. A certain degree of pain is to be expected when pulling out a loose tooth because of the nerve endings at the roots. There may also be a slight swelling and redness which will clear on its own. Consult your doctor if the bleeding is excessive and the swelling and redness seem to increase. Use a cold compress to numb the pain. Place an ice cube on a clean piece of cloth and hold it outside the mouth in the gap area. You can have the child help if they are ready. Do not place the ice directly on the gap as this may irritate the delicate skin. You can use anti-inflammatory medicine for swelling such as ibuprofen but only with guidance from your doctor. Ensure that you follow the recommended dosage. Keep monitoring the gap and be on the lookout for any notable changes that may need medical attention. Once the loose tooth is pulled and permanent teeth have come out, it is imperative that you help your kid care for the new teeth. Proper dental hygiene is essential for healthy teeth and gums. Make sure your kids brush their teeth every day to avoid buildup of plaque which can cause cavities and gum disease. Use a soft brush that is age-appropriate, and toothpaste that is also recommended for children. Try to have them brush their teeth twice a day and rinse with plenty of water each time. If you feel they are ready for it, you can show them how to floss their teeth every once in a while. A proper diet is essential for strong healthy teeth and gums. Watch out for sugary treats and make sure they don’t have too much of that. Keep your child from taking too much carbonated drinks as well, otherwise you will be dealing with more than a loose teeth kid. Make sure to break certain habits such as sucking the thumb. Server responsed at: 04/22/2019 2:19 p.m.